Great news for PC gamers! 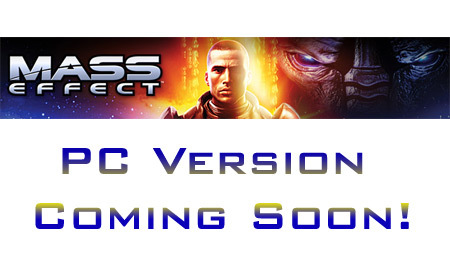 BioWare has revealed that Mass Effect is on its way to the PC platform. Slated for a May launch, the title has been revamped for the PC version. In Mass Effect, gamers play the role of Commander Shepard and have one mission to accomplish – to save the galaxy form impending destruction. Bent with deceit, valor, difficult decisions and a universe filled with unique and colorful species, the award-winning title Mass Effect delivers a truly convincing storyline. Optimized controls designed specifically for the PC. High resolution visuals – Mass Effect for the PC features highly detailed textures, characters and environments. Fully customizable controls – PC gamers can re-map the control scheme any way they like. Run & Gun Control – Players can assign biotic powers or skills to ‘hot keys’ allowing them to play Mass Effect with a heavier focus on action. New inventory screen GUI and functionality – The enhanced inventory system makes it easier for players to equip and modify their weapons and armor. Published by EA, Mass Effect hit the Xbox 360 next-gen console in November, last year. It has been popular not only amongst gamers but is also a critically-acclaimed title with a series of awards and recognitions to its distinction. However, it has also had its own share of controversies, which somewhere or the other only revealed the popularity and the better side of the game. Neither did the Singapore ban hold strong for long, nor did the criticism against the game by critic Cooper Lawrence find much base.